Designed by Stefanie Tuecking of the German Radio Station SWR3 to commemorate a million Amigas sold. 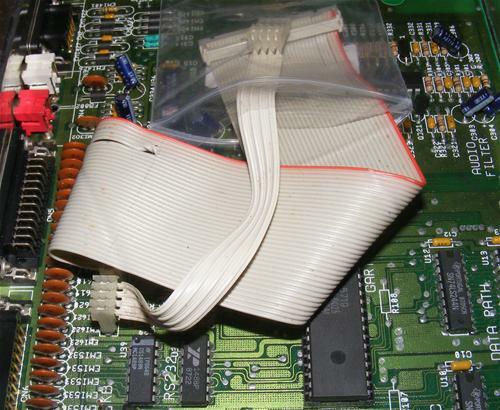 Hi Res version, Early floppy lead? 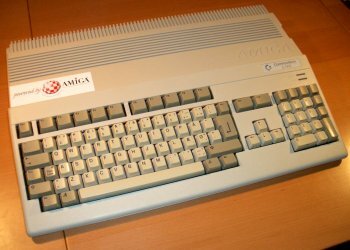 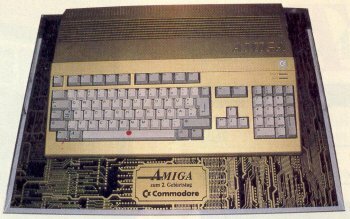 The A500 was one of the most popular Amiga models ever made, partly because it was extremely cheap in comparison to the big box models and partly because it was targetted almost exclusively at gamers. 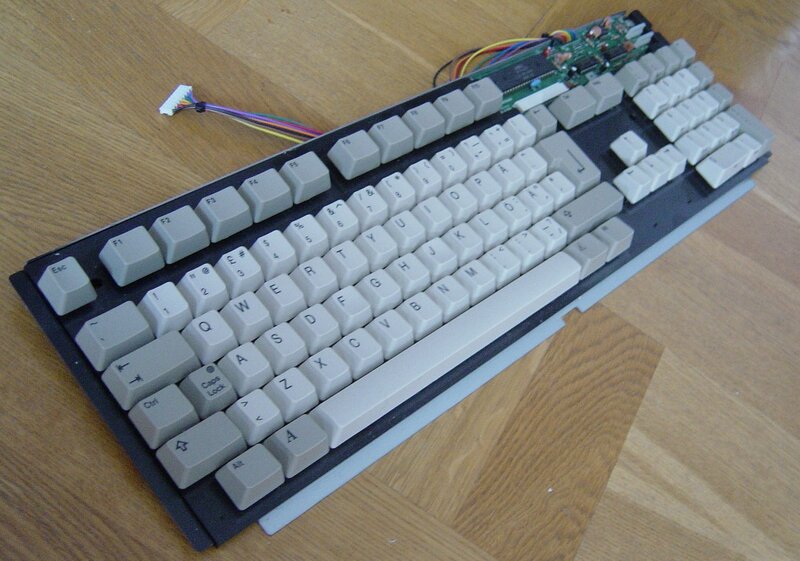 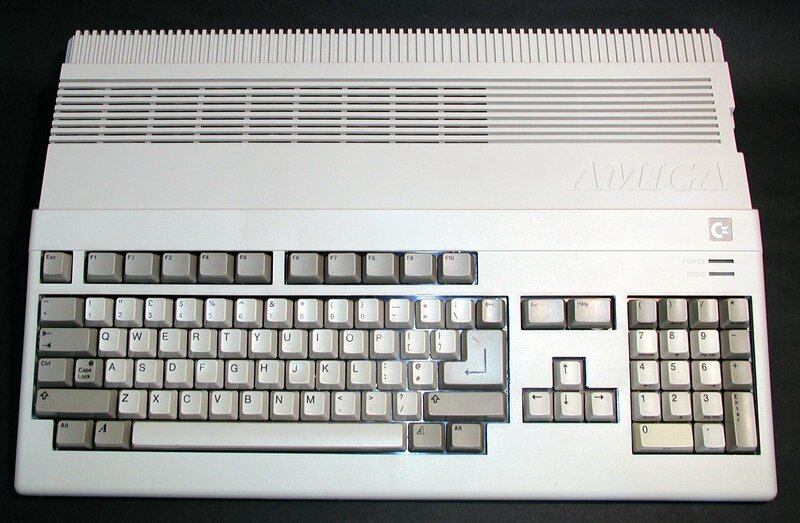 Although the A500+ looks almost identical to the A500, there are considerable differences between the two models. 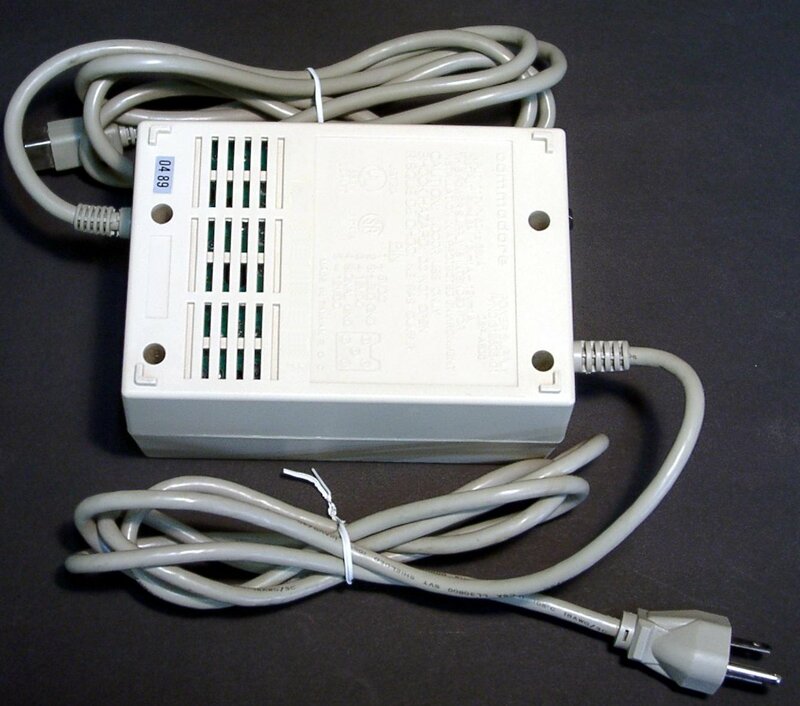 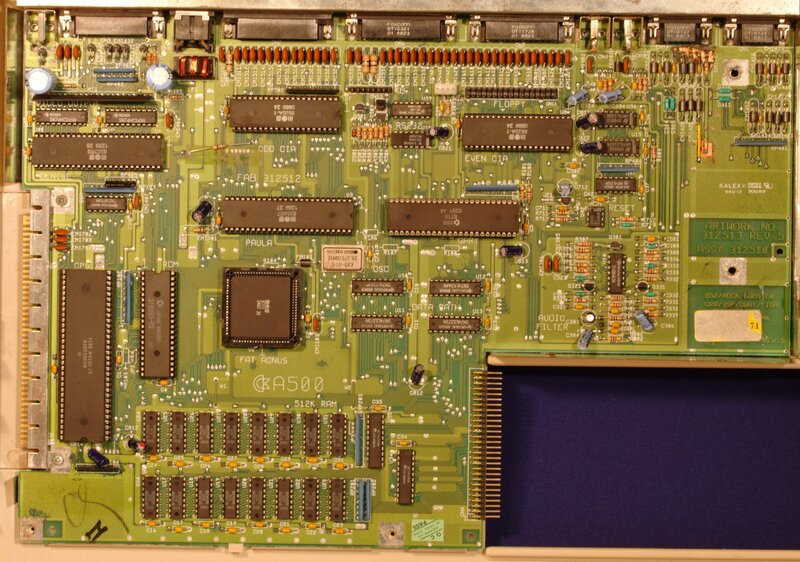 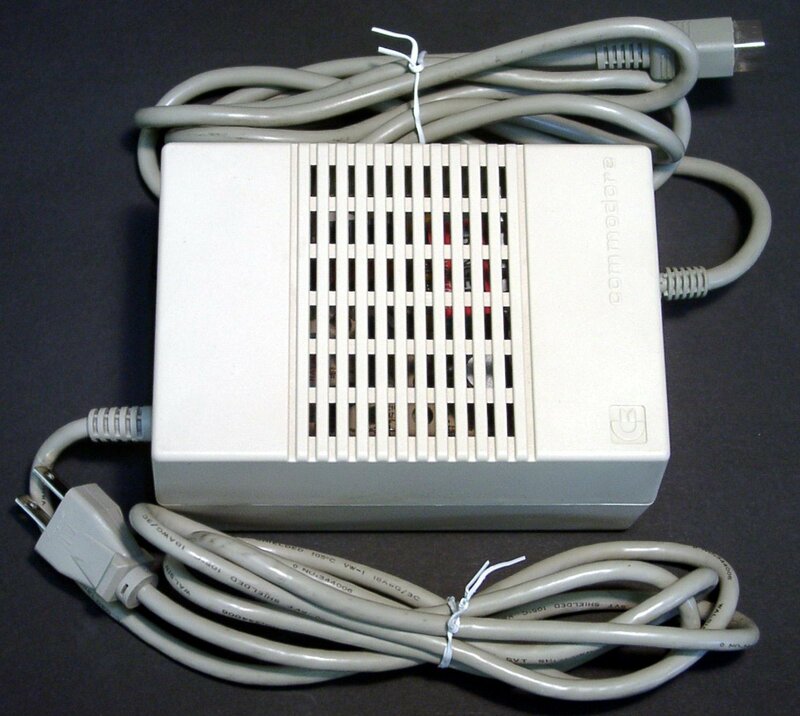 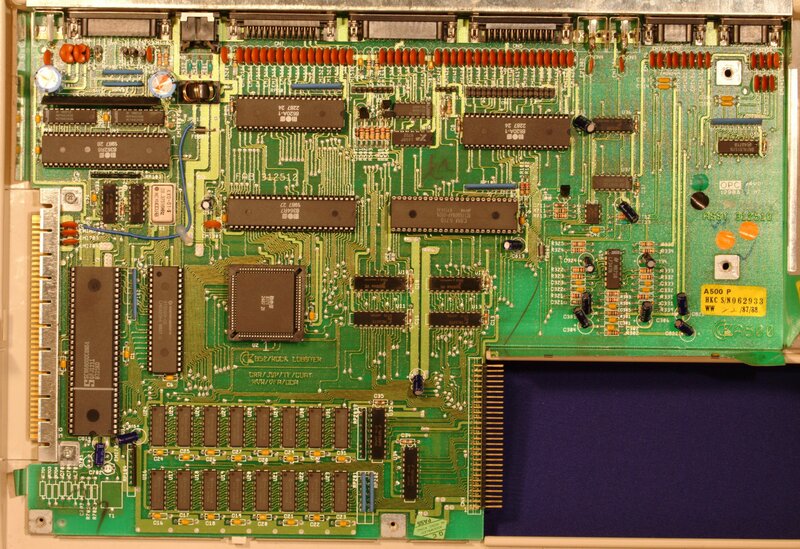 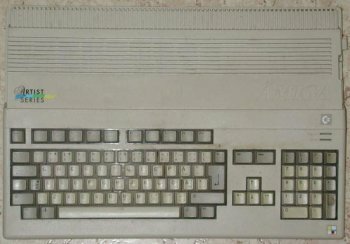 The A500 was usually supplied with the A520 to allow it to be connected directly to a standard television. 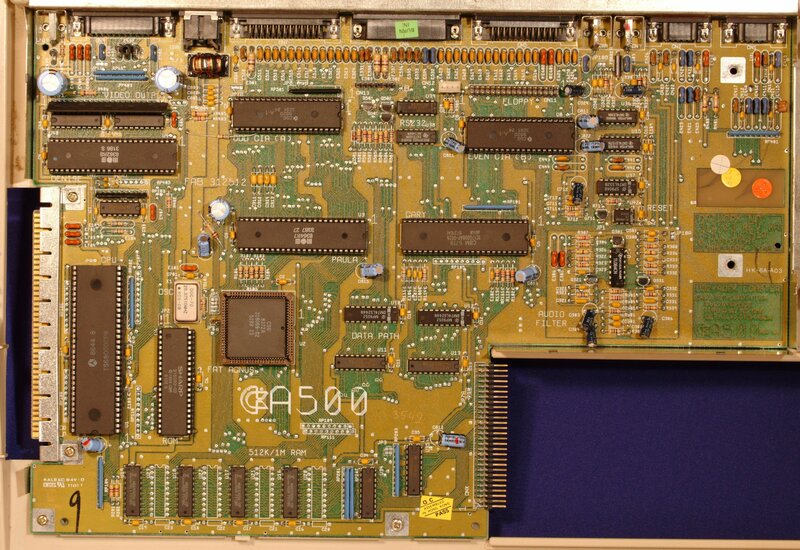 The A500 was supplied with 512K of CHIP RAM by default. 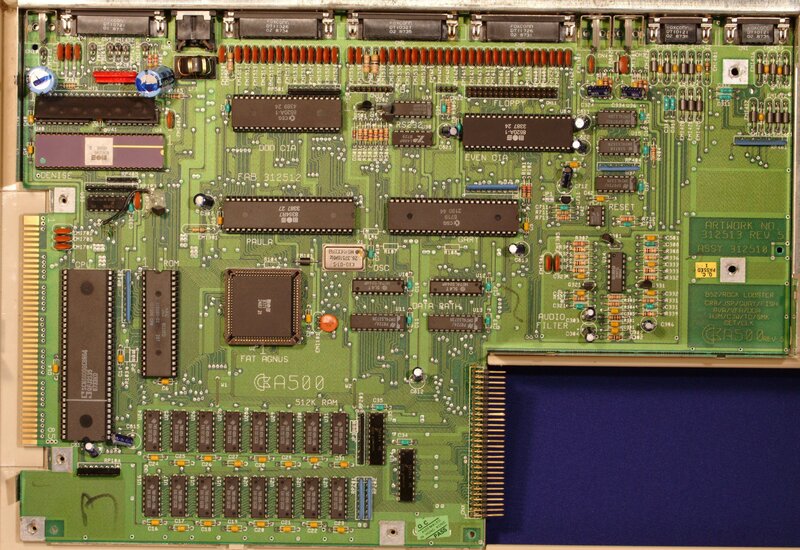 Earlier revisions of the A500 could only address 512K of CHIP but later revisions containing the 8372 Agnus could address 1MB (but were still supplied with 512K). 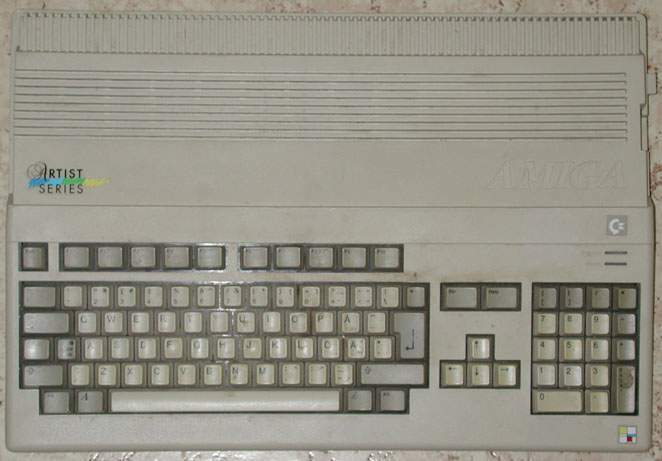 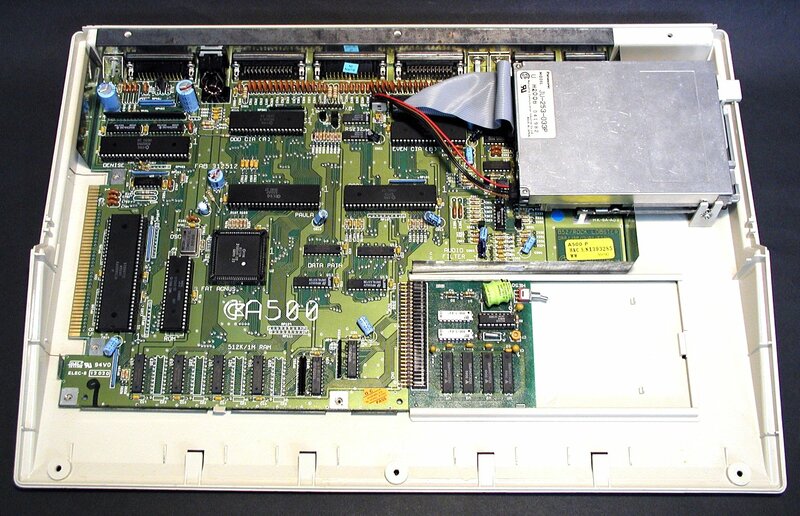 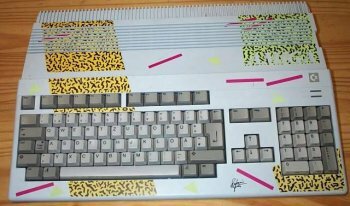 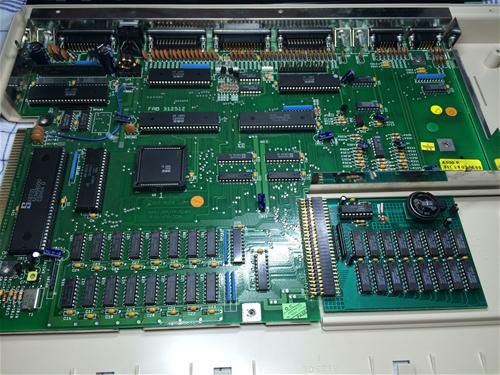 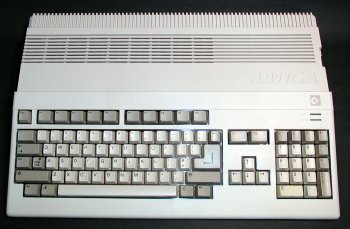 Early versions of the A500 had a red power LED and a green floppy drive LED, whenever the audio filters were activated the power LED would switch off. 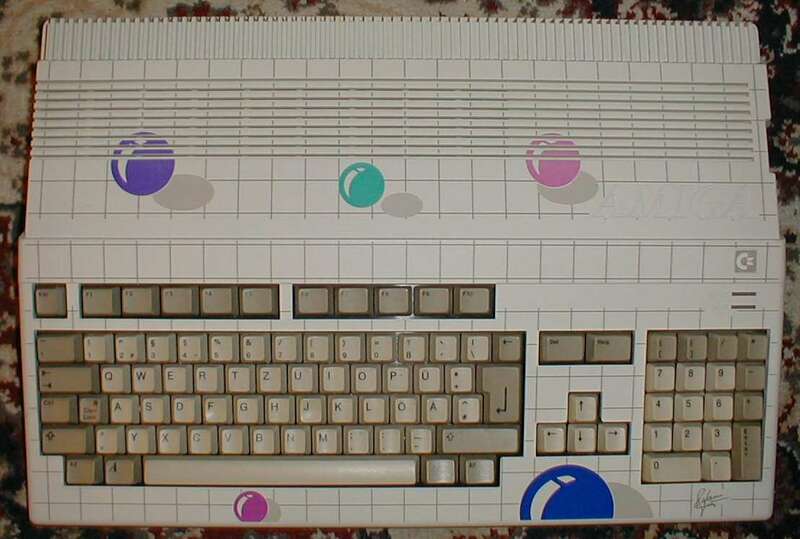 This was later changed to a green power LED and amber floppy LED and again the power LED would be switched off whenever the audio filters were activated. 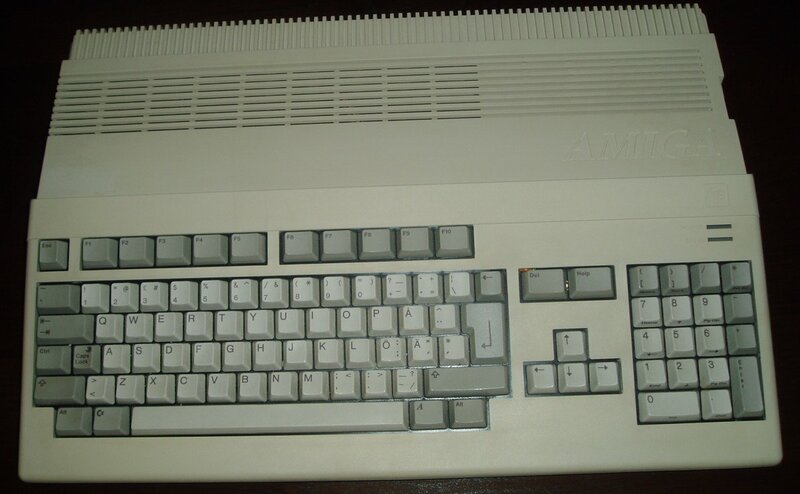 In hind-sight this was probably not considered a sensible indication of the audio filters because the machine could appear to be switched off, even though it wasn't, so Commodore finally changed it so that the power LED was only dimmed when the audio filters were activated and this remained with the A500+. 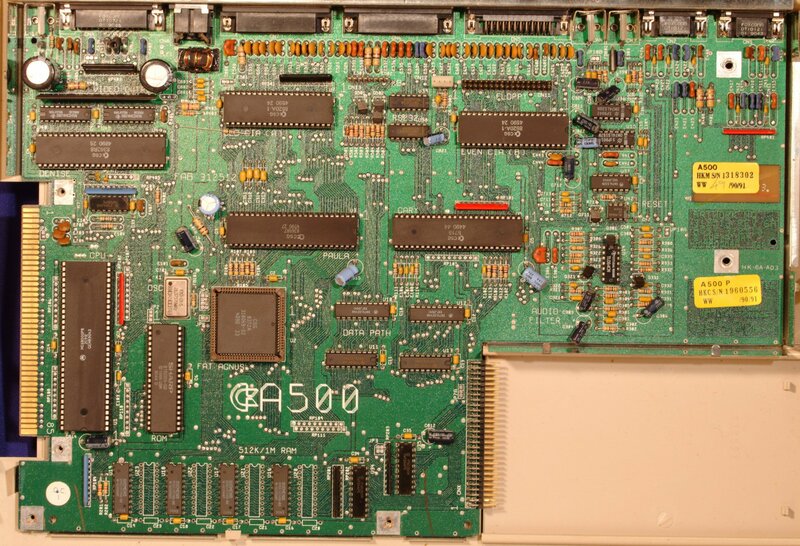 Later A500's may use the same motherboard revisions that the A500+ used, including the ECS chipset. 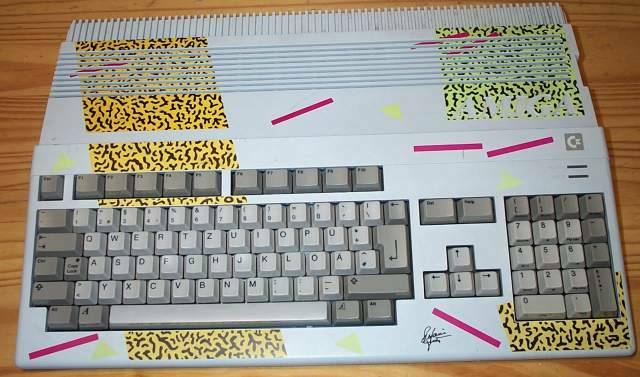 This was probably during a transition period when moving from the standard A500 to the standard A500+. 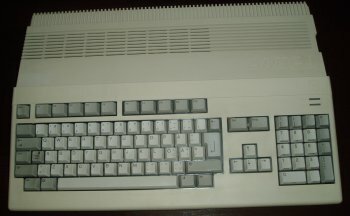 Commodore often used 'old stock' to save money. 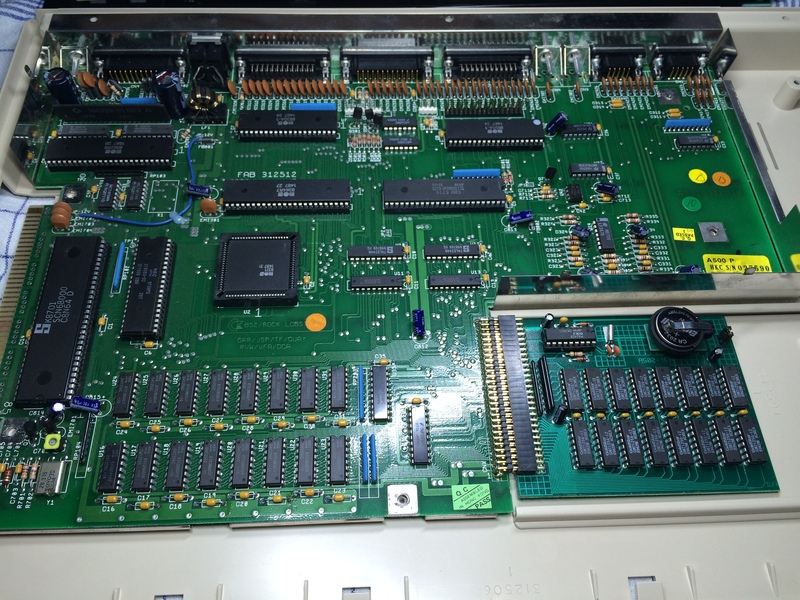 Apparently you can spot Rev 8/ECS based A500s my checking the logo near the LEDs. 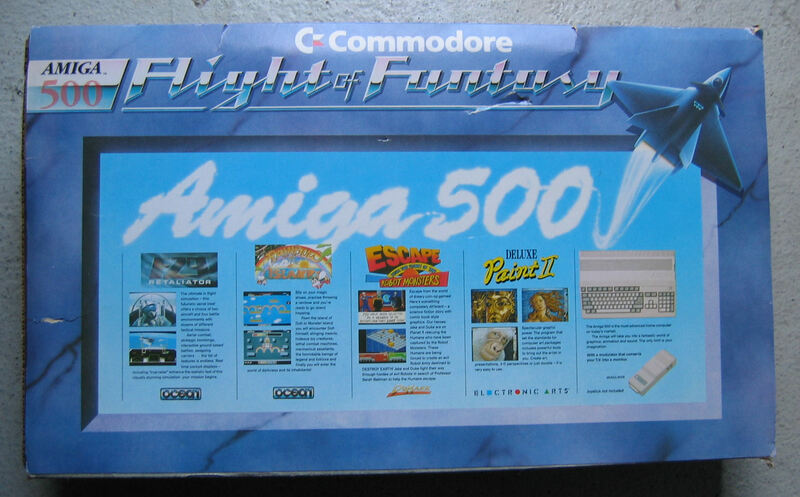 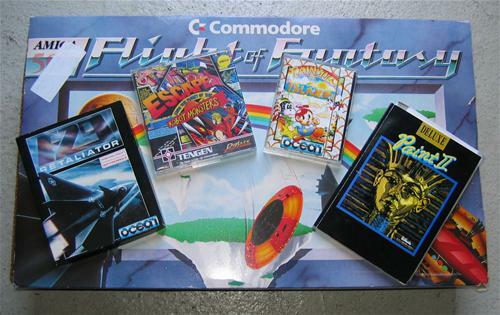 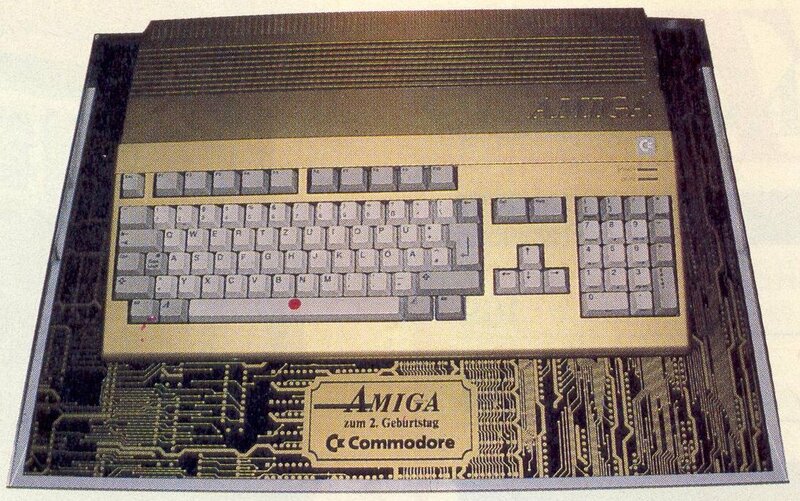 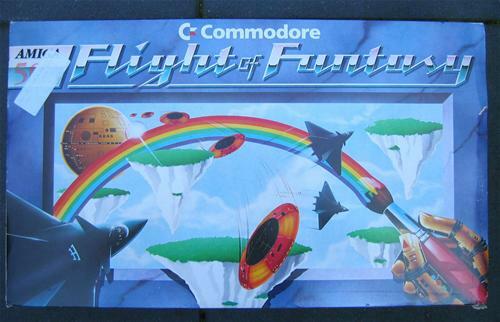 If it's an A500 logo instead of a commodore logo, then it's a newer A500. 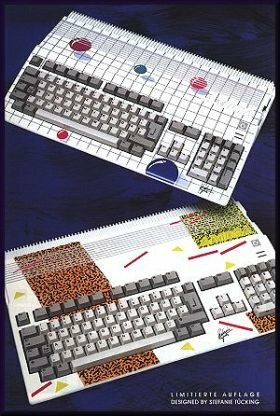 Page contributors: Gerrit Ekkel (Junior), Greg Scott (National Amiga), Iggy Drougge, Jan Pedersen, Jonas Jansson, Keith Emer, Marcus Neervoort, Marius Lauritzen, Markus Nyman, Matthias Latocha, Orjan Lindgren, RiWa & Friends, Simon Vergauwen, Stefan Schakow, Takahasi Kasiko.